Two years in business and I have never looked back. But I am still learning. When I first started my craft business I was aware of some of the skills it would take but there are some I never knew how important they are. Actually I look at these past two years as a training period, like my very own “Running an online craft business” degree. Two years to get proficient at one’s job, it is not too long isn’t it? This is an obvious one but whatever craft your business is about you need to practise, make and re-do. You need to become an expert. Make more of the things you know so you can find better/quicker way to make them. Learn new techniques, make them your own, improve them. Get out of your comfort zone. Explore related crafts, experiment with new materials. You also need to keep up to date on all the above so don’t be shy with the number of blogs, twitter accounts and facebook pages you follow. You’d better get used to it: you are now a perpetual learner. Market research: one way or an other you have to figure out who you want to sell to and what they need. Copy writing: you don’t talk to potential buyers face to face, your copy writing is the only talk they get from you. Packaging: what is better than a customer? A returning customer of course! If your packaging is striking and top notch you’ll make a good first impression. If it is worth talking about your customer’s friends may even try you out. Social media: the trick is not to get talking about your stuff, it is to get people to hear you and talk about it. The beauty of social media is it allow you to engage directly with people, even famous ones, so use it wisely. 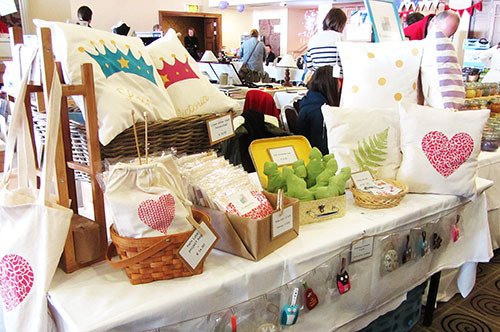 Display: even if your main business is made online it can be a good idea to go off line for a couple of markets or fairs. This is priceless in terms of figuring out what people think of your product, what questions they have and what they actually need. Your display on the day should carry the right image of your brand. Photography: this one is crucial. You need to be able to take excellent pictures. Pictures are all the client sees before they make the decision to buy. Superb pictures can get you a press feature, a spot in a selective market place or market, higher profile among the arty community, etc. Graphic design: chances are you won’t start with a lot of money but you still need proper branding. If you can’t afford hiring a graphic designer, invest a little money and a lot of time in perfecting your graphic design skills so you can have the online presence you need and deserve. Drawing: an other obvious one but as far as I am concerned I never knew how to draw. I have to draw everyday though, each time I come up with a new design. It took me a long time to find my style because I first had to acquire basic techniques. You would save yourself some precious time if you knew how to draw before you start. This is not fun but this is necessary. Accounting: you need to be able to tell if your business is financially sustainable, to file tax returns, manage your bank accounts.d If your not on top of your money you won’t be able to stay in business for long. Process management: to be able to spend more time creating and less time administrating, the trick is to to do the admin before it does you. Know what you are doing, how long it takes, how much it costs. Write down your process and review it from time to time. Fond way to make it easier and faster. Find the time management tools that are working for you. Customer relation management: this is your job too. There are some ways to deal with clients that are better than others. In fact all the above areas are linked and the line between them is blurry at times. Running an online craft business is being able to do all this while keeping this creative sparkle going. Here is the challenge. Previous Post Who won the Christmas giveaway? What a nice shop !